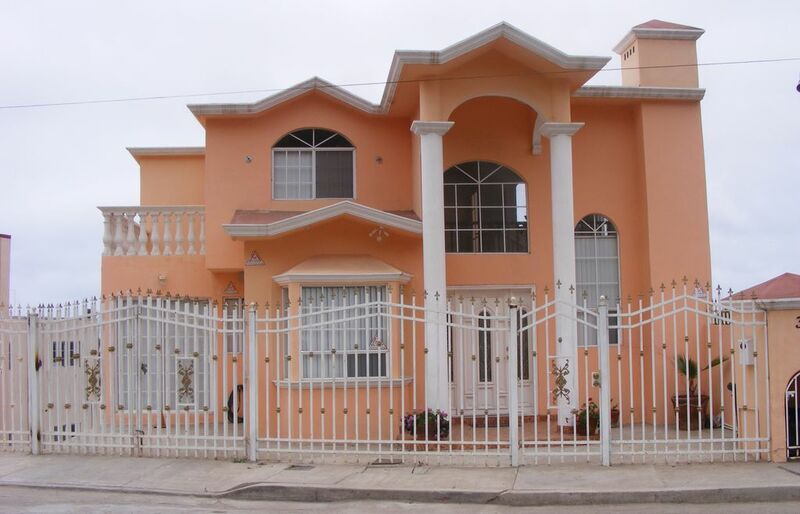 Beautiful House up on the hills of Ensenada with 3 bedrooms, and a studio-room with a futon for 2 more sleepers. Large and confortable beds, two queen size and one California King bed + a futon sofa-bed. This is a Dream Vacation Home with balconies with great view in every bedroom. Up on the second story, there is a large terrace with patio furniture, a gas barbecue grill and patio furniture with umbrella. This main terrace is overseeing the ocean, the port and the city. You will be able to watch the beautiful Cruise and Private Ships, coming in and out of the bay, day and night as well as gorgeous sunsets every evening while you lay in bed in the master bedroom, or from the main terrace having a drink and listening to music with your loved ones by the bar. The house is a beautiful 'mini mansion', it is very safe because it has a security fence around it with locked gates and a 24-7 monitored alarm system hooked to the police for immediate response in the event of an emergencies while you are in the house. The house has a land telephone, Cable TV, a desk computer with internet and WiFi service for your personal electronic devices. There is beautiful furniture in every room and a modern fully equipped kitchen for cooking and utensils. The house is equipped with 'emergency water tanks' and a pressure pump system, so that you never run out of pressured water. The house is located in a nice exclusive neighborhood in town, with groceries stores, farmacies, gas station and AM-PM store just down the hill. There is also medical services at an emergencies hospital near by. Downtown Ensenada shopping and all of its day and night Club action is only a mile and a half away, a five minute drive. The only Public Beach 'Playa Bonita and its Malecon' is six blocks away from the house. Everything is near you and yet you will have enough seclusion, privacy,comfort and safety to enjoy your vacation near downtown Ensenada. Plenty of parking space, for 4 cars at the bottom of the lot secured by walls. Me and my wife like to travel a lot anywhere that offers a vacation full of adventures. We are both retired teachers and consider ourselves in permanent vacations to enjoy life in this beautiful world. We have had this beautiful vacation home in Ensenada for nine years and will be glad to share with you the beauty, comfort and safety of our vacation home in Baja California. Its very beautiful, safe, high on a hill providing an expectacular view day and night and ultimately it is centrally located near everything Ensenada has to offer to their visitors. The house is only six blocks away from the main Public Beach, Playa Bonita, and is always bathed by the fresh ocean Breeze. The neighborhood is very nice and safe. Someone will welcome and tour you around the house before giving you the keys and security system remote control. This persons will be available to you 24-7 in the event of any problem with the house and will immediately respond to your call. Up on a hill, the view is spectacular everyday, every bedroom has a view and balcony. The main terraze is unique for a relaxed barbecue evening to watch the gorgeous sunsets and the cruise ships that arrive and depart from Ensenada Port everyday of the week. toilet, shower, One large full Bathroom in the master bedroom downstairs. toilet, shower, One large full bathroom upstairs for two bedrroms. toilet, toilet and sink near the living room downstairs. All of the Ensenada day and night action is only one and a half miles from the house. You need to provide wood. There is also an electric oven over the kitchen counter. Large modern Kitchen with all cooking and eating utensils. There is a small bars in the kitchen that can accommodate three more eaters. You may rent one at the port. Provided when you purchase ocean fishing trip. Wheelchair accessible but only downstairs on the first floor. Land telephone and a monitored alarm system with "panic button" hooked up to the local police 24-7, a modern and fully equiped kitchen, cable TV with DVD player and a Stereo Sound System. Plenty of parking space on the street of a fluent neighborhood and inside the property for 5 vehicles, at the bottom of the lot with walls and fence around it. There is space for one car in the front of the house inside the fence. Someone will welcome you at the house, and will be available to help you 24-7 with any problems you may have with the house. 100% refund for cancellations more than 30 days before check-in date. 50% refund for cancellations more than 14 days before check-in date. We had a good experience this past weekend in this Ensenada home. Fully equipped with necessities and enough space for a large families. We had an issue with the refrigeration cooler the first night and the owner made sure to have someone come out the next day. Unfortunately, the AC guy said nothing could be done until the following Monday due to a piece he needed. The house was definitely warmer than we’d like to have it, but not awful. The location was ideal and close to everything we needed. Felt very safe. There was also lots of bugs around the back parking area, recommend bug spray. Thank you for your review Mrs. Gonzales. It is always good to know how things went during your visit and how things can be improved at the house for future guests. I apologize for the unexpected unit break down. The house is naturaly cooled by the constant ocean breeze when it is allowed to circulate through the house by opening a front and back window. The A/C unit is there for people who preffer closed doors. Unit was fixed on Monday. Parking lot has been sprayed throughly. Thank for your good and honest review. First off dealing with the website was a joke in the beginning! After finally jumping through hoops with that part of it, I was able to be in contact with the home owner via the website directly. He was amazing to deal with! The house was awesome, and everything he said it was. Very close to town, very safe and secure, yet out of the way in a good way. Thank you Rene for making this as painless as possible! Hope to be back next year! Hi Mark, I am glad to hear good things from another one satisfied guest, specially from someone who leads a car racers group. I felt the excitement of being part of that very special event, Baja 500. Thank you for your preference and hopefully we will help you again in the next off road race you guys participate in Baja CA. Beautiful home! Perfect for a get away with your family or friends. Only 10 minutes away from all the clubs and tourist area. I highly recommend it. I felt very secure =) Rebeca gave me a tour of the house and was very helpful. Thank you Araceli for your Review, its nice ! Me and my wife, always put ourselves in our guests shoes and try to make things the way we would like them to be if we were to visit a vacation place and rent a home in that town. We are glad you liked and enjoyed the house because that means you will be back in the future and talk to your friends and relatives about your pleasant experience. Let me start off by saying it was AMAZING! The house was very clean and big enough for my big family. It's a beautiful well taken care of house. The best part about it was the location, near everything. We really enjoyed our stay in Ensenada and can't wait to go back the following year. Thank you to the owners who made it so easy to reserve the dates as well! This was my first time renting a vacation home via on line, so I went through pay pal, the whole transaction with the owner Mr. Guevara was very pleasant he not only replied back right away but also answered all my calls when he provided me with his personal & residence phone number. We arrived at his beautiful vacation home in Ensenada we were really surprised it was better than in the pictures 7 Adults and 3 kids fit we all fit perfectly, house was clean and had all you can think of, Wi-Fi came in handy for the kids, the location was nice and quiet. it was so close to the sea you can literally feel the breeze from the balcony, nice perfect weather, my family and I are already planning next years trip and would love to stay here once again, or even sooner. The only concern I had was when showering the water was kind of salty not like the sea salty but it was a bit you could taste it but i'm sure that was a city problem not the properties, we really did not interact a lot with Carlos & Alma but they seemed good people when they hand over the keys. We are so thankful with Mr. Guevara for being to professional and we will definitely be in contact soon, once again thank you so much. I am glad to hear you and your family had an excellent and extraordinary vacation time in our Ensenada Hills Dream Home. Me and my wife are always striving for complete satisfaction from all of our guests and its well know that most of my guests are come backs, like you, because of not only having met your expectations, but surpass them. The problem with Public Water in the city is something everyone lives with in Ensenada. It is clear clean and safe to take a bath but not for drinking. I have two filtering systems in the house and some stuff still percolates through. I will see that the filters get checked and replaced if necessary. We always have a couple of 5 gallon bottles of drinking and cooking water in the kitchen water dispenser in order to be on the safe side when it comes to water consumption. We will be glad to have you as a guest in the near future, and thank you for the review. Its nice to hear good things and also make ourselves aware of anything that needs our attention in the house to make it better. Most of the Ensenada Special Events, cars, motorcycle and bicycles races take place at the "Malecon" along side the Playa Bonita Beach, located 6 blocks away from the house. At this beach you will also find horses, quad-bikes and small boats for rent, so that you can ride on the beach. There are daily fishing boat departures for deep ocean fishing wether you are a profetional or amateur fisher. You don't even have to have equipment, most services provide everything you need to catch a big one. There is a night club in front of Playa Bonita beach "Casa Country", with live music and sports bar only 6 blocks away from the house! And lots of other Fun Night Clubs in downtown only a mile and a half away from the house. You may call for a cab to take you back and forth downtown for aproximately $10.00 dollars round trip. Lots of Mexican Arts and Crafts stores in the downtown area with tons of fine restaurants to pick and choose, some of them with live music and sidewalk full service on the main "Primera" First Street. Not far from here you find several Wine Tasting warehouses that offer free "wine tasting" as you visit their shops and restaurants. The walkway along the "Bahia de Ensenada" with shops, movie theaters and private boats is lots of fun too. You can also enjoy the boat displays including the various Cruise Ships. The famous fresh fish market know as the“Black Market", don't know why, where you can buy all kinds of fish, and have it sliced in front of you. This area of the port has daily departures for Bay Tours as well as Fishing Boats for private hiring or group boats. You may also rent quads-motorcycles in front of the port to cruise in the downtown area or take short city tour in a "Calandria" horse carriage for a romantic and fun ride. The exciting and fun night life in downtown Ensenada is one of the highlights you don’t want to miss with lots of famous and "hot" night clubs to enjoy with your friends. Some of these night clubs stay open until 4:00 a. m. on weekends. All of this is just a five minutes drive from the house, or if you prefer there are bilingual taxi drivers available with just a phone call. Ensenada has 7 Casinos spreaded in the downtown area where you can gamble all night long. If you are looking for the Downtown Action/events or bussiness, we are the closest, largest and nicest house for rental in Ensenada. The house is only one mile south and 6 blocks East of the Giant Mexican Flag Monument in downtown Ensenada. The world famous nature wonder Blow-Hole "La Bufadora" is only a 40 minutes drive from the house. Ensenada is considered one of the safest city for tourist in Mexico, and the proff is the thousands of tourist that visit this city from all over the world, including several national and international cruise ships every week. Nightly Rate: $200 - $250 Weekly Rate: $1550 Monthly Rate: $3500 - $3800 $200.00 Dollars a night week days Monday through Thursday $225.00 Dollars a night on weekends Friday through Sunday and or Holidays $1,100.00 Dollars a week + $50.00 Dollars for cleaning fees. Rates may be slightly lower or higher depending on the season of the year, holidays or special events. Call for details and for a special introductory offer discount deal. Must reserve well ahead of time, be able to sign a rental Contract agreement, pay 1/2 rental fees in advance for reservation and the rest two weeks in advance via personal check, bank check or bank transfer/deposit. You can also pay through paypal or with a credit card for an additional $25.00 credit card fee. Renter will be required to leave a refundable deposit of $300.00 dollars which will be reimbursed after inspection of the property and telephone charges are calculated. We will accept a personal or Co. check as the security deposit which will not be cashed or deposited unless there are any damages or lost items to the propperty. Some of these requirements may be waved when you are a repeat guest.